The viewing experience of live performance is an intrinsically temporal one. Whether it be musical, theatrical, experimental, spiritual or otherwise, there goes an unspoken aspect of what we share in the experience: the movement between moments and how these move us together. St James the Great Church regularly offers a home to these types of communal experiences by lending it’s baronial sanctuary to singing and praise. The church’s website describes it’s community: “We are very diverse and speak many tongues. We love to share the good news with all who have ears to ear. We don’t ask where you come from, we celebrate your coming.” This diverse community has expanded to embrace the sporadic congregation known as the Church of Sound, adding jazz, funk and future sounds to the list of St James’ many tongues, and of course many more ears to hear some good news. This time around, the CoS has invited Brandee Younger to come play with her trio featuring double bassist Sean Carter and London bred drummer David. 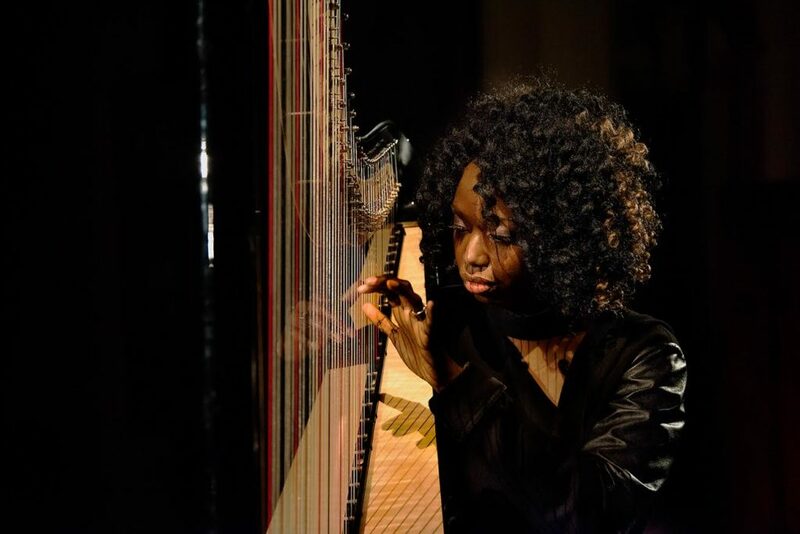 R. Many faithful fans of the church attended to hear this one off performance titled The Harp Ecstatic, which is likely an apt reference to the recently released compilation The Ecstatic Music of Alice Coltrane Turiyasangitananda (it also hints at A Love Supreme with it’s form). Alice Coltrane’s illustrious and inspiring discography still retains a spiritual depth and influence that feels as present as ever so it is no surprise, and quite the delight, to have her music appear as a staple of the night, reimagined by Brandee and co. The CoS requires an introduction itself: this creation of Spencer Martin and Lexus Blondin has been offering a unique experience of live music and curation for some years now. A consistent setting in the enamouring St James Church enables a panoramic viewing experience with artists in the middle of the room, and the event features fresh home made food (a superb plate-sized banquet for only £6) and a service-wide coterie. The format always sees the artists perform two sets separated by an interval; the first provides the artist berth to explore pieces taken from the songbooks of alternative jazz greats, the second is usually filled with their own compositions. This introduces an evolving atmosphere as evening turns to night, gently shaped by the venue which cultivates a unique, appreciative and sociable air to the evening. After walking through some rain, I arrived to the church early in the evening. Standing outside it’s stocky cruciform shape, the mixed red and grey brick exterior doesn’t much hint at the regal vastness of the vaulted interior that surrounds the church’s nave. I entered upon the doors opening to see Lexus take to the decks which are set up facing the band’s setup, in the middle of the room facing most of the audience pews as if it were his own lectern to preach from. The increasingly renown crate digger has a history of curation via radio, DJ sets and bookings; it was via his recent travels to America that he met Brandee Younger and tonight’s event was conceived. He used this first part of the evening as an opportunity to dig deep into his records and pull out a range of sounds across the decades and sub-genres that guide us into the open ended world of jazz. A cordial air rose as guests filled the space leading up to the strike of 9pm when the bar temporarily closed and the lights turned down. Lexus addressed the audience, expressing a desire for everyone in the room to engage in a shared listening experience of a recording before we dig into the live performance. Citing the wordless connections and understanding that the language of music can encompass, he took out his vinyl printed with Hypnotic Brass Ensemble’s Book of Sound, and dropped his needle onto a track called “Kepra”. We all sat quietly in the dark as the sound, slow and sombre, coursed out through the PA system. A soft chorus of brass harmonies glided over a softly played run on the bass guitar, repeating a two phrase melody throughout the 6 minute run of the piece. “Kepra”’s gradual movement focuses attention to all the most subtle changes and feelings in the track, making the heavier emotions within the bars incredibly tangible. As the lights came up, the trio took to their instruments and Brandee introduced the first piece, “Rama Rama” composed by Alice Coltrane. A moment of stillness precedes the first notes but in Brandee’s experienced composure, not even the most naked silence can betray the slightest hint of hesitation coming between her and the strings. Her playing immediately charms with a flawless and heavenly sound. “Rama Rama” reveals itself to be a wonderful capsule of Brandee Younger abilities and style brought to the forefront. These first impressions come with sublimity. A calm demeanour shows visibly in her expression and poise and translates into the sound. Brandee’s control is meticulous, her fingers enter a mesmerising flow every time she starts playing, becoming graceful as ever through the fluid motion of her hands. It’s enchanting to focus in on her technique. The double bassist Sean Carter is similarly able to reach to any note at any time, but his style contrasts Brandee’s in that his hand movements are more frenetic. His movements regularly become hyper but not panicked, rather they act as if his hands are dancing across the neck of his double bass, sometimes travelling along the full length of it impressively. This contrast can be heard as it lends to a very percussive playing style when his fingers tap the strings and fretboard, making him something of a halfway point between Brandee and drummer David. R.
This first of two sets was chiefly comprised of music from both Alice and John Coltrane and Dorothy Ashby. This focus on spiritual and modal jazz doesn’t imply the same kind of raucous energy that can grow out of these worlds. Drummer David hangs back, playing with a laid back and considerate touch. This allowed Brandee’s textured style the space it needs while giving Sean allowance to inhabit that mid-world between the two with effervescence. David played with a dedicated attentiveness. Had he not been so disciplined in approach, its hard to say the serenity in the music would have come forward so much. In this way it feels like the result of a considered artistic decision: instead of the senses becoming awash in spiritual cacophony a la Sanders or Ra, the many complexities comprising the soundscape meticulously plucked at one’s attention and allowed the mind to more sensitively behold what is being voiced, when and how. Flourishing runs along the harp were construed into otherworldly timbres through Brandee altering the way she’d run her hands along the bed of strings. Using some pedals sparingly she modulated and manipulated her playing in alien ways. The frugal use of sonic manipulations came across with tasteful and interesting effect. Layers of consideration come into focus this way. The reverberation of a large church hall already helped the natural timbres transcend its natural beauty. As I mentioned above, Brandee’s playing carries a textured cross of harmony and melody, breezing between and blending the two in a way that occasionally tricked the sense in hearing another instrument or voice not really there. The respective space each player gave and received was also paramount to the exquisite sound they produced together. Returning after the interval, the trio kicked into the first original of the night, “Essence of a Ruby”. As we then saw with every piece performed, they completely reimagined it to fit their arrangement as they did the covers. Every moment to moment felt unique, as if this piece might not be heard again in this form. Another original, “Hortense” bloomed when gifted with a slow drum groove. The offbeat emphasises and dreamy key changes really popped out in a new way with this simple trio arrangement. Throughout the two sets, Brandee’s hints that a given song might go one way or the other (she said there might be bits of “Journey to Satchidananda” peaking out in their rendition of “Blue Nile”) gave the impression that more than what we might expect is being improvised in front of us. The level of attention the trio pay to each other throughout also leaves the same impression. Brandee Younger’s passion would always ooze out when she spoke between songs. She stopped herself at times from delving into stories regarding the musics of other musicians. The fact she chose to continue exploring the music of other artists in the second set clarified this sort of selfless love of music; her last piece was a mashup of many more songs, lesser and better known. The trio brought a dynamic set of pieces together with a great impact. Throughout the night we were treated to moments of serenity and solo moments from Brandee and Sean, contrasting with jazz and pocket beats served up by David and this final medley brought all this and more, at times to great cheers from the crowd. The evening was lengthy and filled with many lustrous sounds, ending in the last minutes of the night. 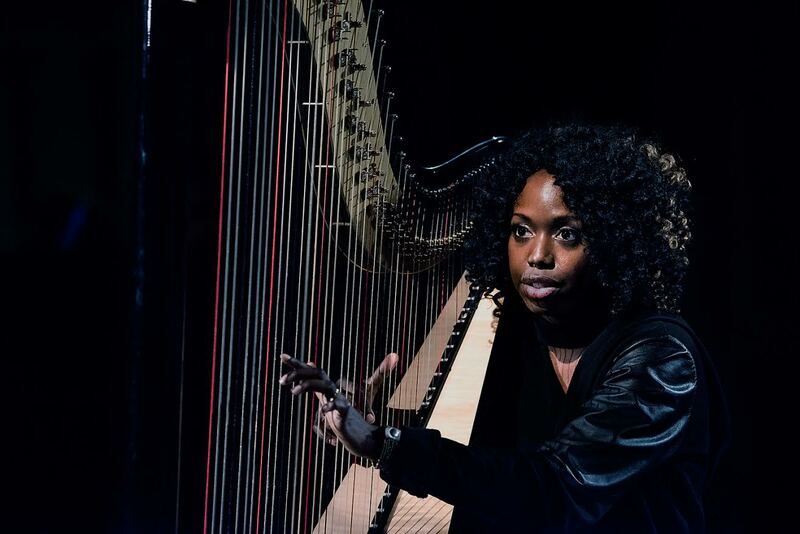 Everything about The Harp Ecstatic lined up with the spirit of the Church of Sound: it showcased the deep appreciation and sharing of music-past combined with the reframing and reimagining to create entirely new experiences. A diverse community of music lovers were fortunate to have arrived to another special evening in the Church of Sound, and to share in a communal experience that comes second to none.